Cherrapunji in the state o Meghalaya takes the record of being the second wettest place on earth with a rainfall record of 2,300 cm.But however according to a recent study this title is taken away by Mawsynram, 55 kilometers from Shillong.Cherrapunji is noted for its orange groves, orange honey and the limestone caves.Cherrapunji is situated at a distance of about 56 km away from Shillong and at an altitude of about 4,500 feet .The Guinness Book of World Records has notes carrying about this misty valleys as the wettest place on earth, the place where the rainfall can be recorded in feet rather than in millimeters. The other main feature of Cherrapunji is that it houses the world's fourth highest waterfall the Nohkalikai Falls which is at a distance of 5 km away from Cherrapunji.This land of pristine beauty is the only place in India which has the monsoon season throughout the year. 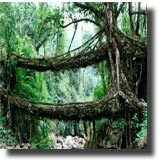 One of the other major attractions of Cherrapunji is the living bridges where for years and years people have developed techniques for growing roots of trees into large bridges. The process takes 10�15 years and the bridges typically last hundreds of years, the oldest ones in use being over 500 years old. Cherrapunji in the north eastern state of Meghalaya is situated at an altitude of 1,484 meters high in the southern part of the Khasi Hills, facing the plains of Bangladesh. It coordinates at 25.30�N 91.70�E. The ideal time to visit Cherrapunji is between the months of September to October. 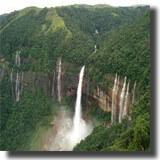 Cherrapunji was initially named as Sohra, pronounced as "Churra" by the British. But however now again the government of Meghalaya is decided to refer Cherrapunji by its original name. There are evidences for this place being under the British for a period like one can see the monument of David Scott who was the British Administrator in NE India, 1802�31.Though the place receive rainfall throughout the year irrigation is not possible here because of heavy rain the topsoil is washed away and as a result of this you can see encroachment of the people into the forest. The Nohkalikai Falls is supposed to be the world's fourth highest waterfall and it can be viewed only during the monsoon season. This waterfall is situated at a distance of about 5 km away from Cherrapunji. The waterfall starts off as a clear bubbling stream and turns into a majestic waterfall gushing down the rocky precipice into a deep gorge. The Thangkharang Park under the State Forest Department control, directly overlooks the vast plains of Bangladesh is at a distance of 12 kilometers from Cherrapunjee. It gives a magnificent view of the criss-crossed plains with wide rivers on their final leg to their journey to the sea are visible from this hilltop. Another main attraction of this park is the 200 feet giant Koh-ramhah, a natural single rock formation, shaped like an upside down basket. The Kynrem Falls which falls from an altitude of 1000 feet high can be seen from across the park. It is supposed to be the highest waterfall in the state. Double Decker Root Bridge situated in the Tyrna village is considered as an example of the achievement of bio-engineering. This is a two-tier living root bridge which is estimated to carry at least 50 or more people at a time and is over 100 feet long. It takes nearly 10 to 15 years to become fully functional, and gets stronger every day. 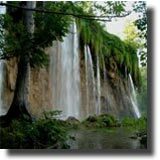 The Dainthlen waterfalls are one of the ideal places for picnics and the drive to this place is very pleasant with the scenic beauty around. There is a village nearby Rangjyrthei, which should not be missed. Close by is located a beautiful intricate structure of interconnecting underground passages beneath age-old caves. It is quite adventurous and interesting to explore this place. 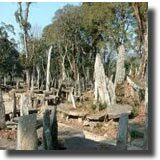 Elsewhere around Cherrapunji, Khasi monoliths which are the stones in memory of their ancestors lie scattered around. Mawsmai Falls just a few kilometres away from Cherrapunji falls from a height of 1,035-ft and is supposed to be the 4th highest in India. 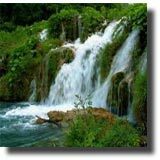 Other places of interest in Cherrapunji are the Kshaid Dain Thlen Falls, Nohsngithiang falls, Cherrapunji Meteorological Observatory, Ramakrishna Mission Museum, First Presbyterian Church, David Scott Memorial, etc. 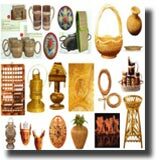 Cherrapunji is quite famous for the tribal jewellery and orange-flavored honey. Pawan Hans has provided a Dauphin helicopter to Govt. of Meghalaya for running regular passenger services on Guwahati- Shillong - Tura sector. You can take a bus or taxi to Cherrapunji, after reaching Shillong. Cherrapunji is 60 km from Shillong, the capital of Meghalaya. 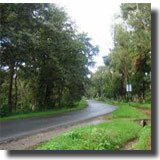 A steep motorable road, are available, which leads up to Cherrapunji. Buses and taxis ply to Cherrapunji from Shillong. Guwahati (181 km) is the nearest railhead to Cherrapunji. You can either take a bus or hire a taxi from the Paltan Bazaar bus stand in Guwahati.